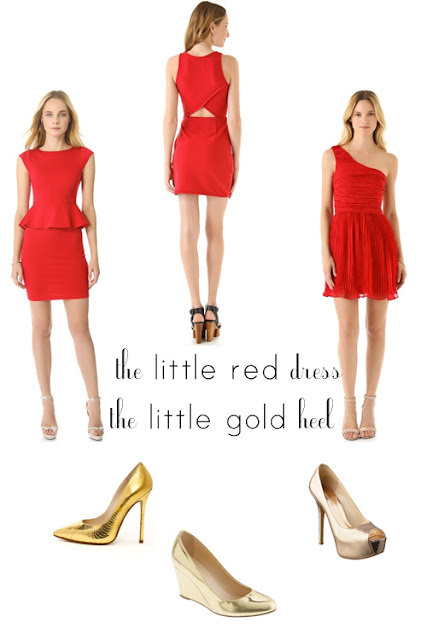 Can you think of anything more festive than a little red dress paired with a little gold heel (especially paired with a red lip and low chignon)? Inspired by the lovely lady above, I've found three red dresses (all in different price points) and three gold heels (one pump, one wedge and one peep toe heel) for this week's Friday's Fancies post. Do you have any holiday parties this weekend? What are you wearing? I love this! I blogged about red and gold today, too. Perfect color combo, I think. Love this idea!!!! Our friends weren't able to find a sitter so we are staying in unfortunately. I'd still like to dress up though!